Many of the small businesses are expanding customer networks and taking on new employees to meet increased demand. Expansion can be very exciting, however, it can also be very challenging – particularly making sure that you’re looking after your workforce adequately. As your business grows, you need different policies to keep pace with the number of employees, benefits you’re offering, and the sums you are insuring. Identify your business' development stage and the associated risks is absolutely critical in order to protect that growth. Am I insuring my growing business adequately? It’s likely that you’re focused on cash flow and profitability right now, which is no bad thing. However, even though your fortunes are good at present, it’s important to think about protecting your operation should you encounter something unforeseen. Your staff, your customers and your office are all dependent on you, the business owner, being fit and healthy to work. In a small business in particular, success rests on the senior team. So what would happen if you suffered a serious accident or illness and were unable to come to work for a long period of time? And, although we don’t like to think about it, what if the worst happened and you suddenly passed away? Not only are you an incredibly important cog in the business wheel, if you’ve guaranteed a business loan, a compromise to your health could seriously affect your organisation’s financial stability in other ways. Arranging a business insurance policy is a simple and straightforward way to safeguard your company from nasty misfortunes. Even if the business is thrown into turmoil by your absence, you have the peace of mind that you will be financially protected. Am I insuring my key personnel? It’s not just your own role in the business that you should be concerned with; you have a responsibility to your staff, too, and as your workforce grows, so does the number of people to look out for. A good way to attract and retain talented staff is to offer a solid benefits package that goes beyond pay. Since the introduction of Auto enrolment workplace pension schemes, you are likely to be already paying into, or soon to pay into, a workplace pension scheme for your staff. You may also offer bonus holidays for long service, and on-the-job training. As part of that benefits package, you can insure key personnel, to cover the cost of any long-term absences, recruiting and training a replacement, and the impact it may have on key customer and supplier relationships. Am I protecting my business when key staff are unable to work? As we alluded to in the previous question, the impact of senior level employees being long-term absent is widespread. It can interrupt the day-to-day decision making process, leave skills gaps in your workforce, and affect the chain of command. 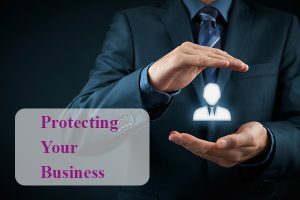 Additionally, if that person has responsibilities with people outside of the business, your customers and suppliers could potentially lose confidence if the person they’ve built up a relationship with suddenly disappears. Taking out a business insurance policy covers the financial and practical implications of serious staff sickness, so that a significant period of absence doesn’t get in the way of your small business growth.